Kids these days just don’t get it. They don’t know what true rock and roll is all about. It’s not about being some kind of pretty boy wining into a microphone about the girl who dumped you. It’s not even about ripping guitar riffs or meaty basslines. It’s not about choreographed dance moves or even cool music videos. Rock and roll is all about tight-fitting leopard print pants. Yes, that’s right. It’s a truth that 80’s rock stars knew. Rock and roll begins with attention-stealing style! We’re talking long hair that’s teased a mile high. We’re talking neon colors that make you impossible to ignore, whether or not you’re rocking out on stage. Once you have that, then you can worry about learning how to play guitar, or about writing a few songs. Get ready to become the embodiment of rock and roll! 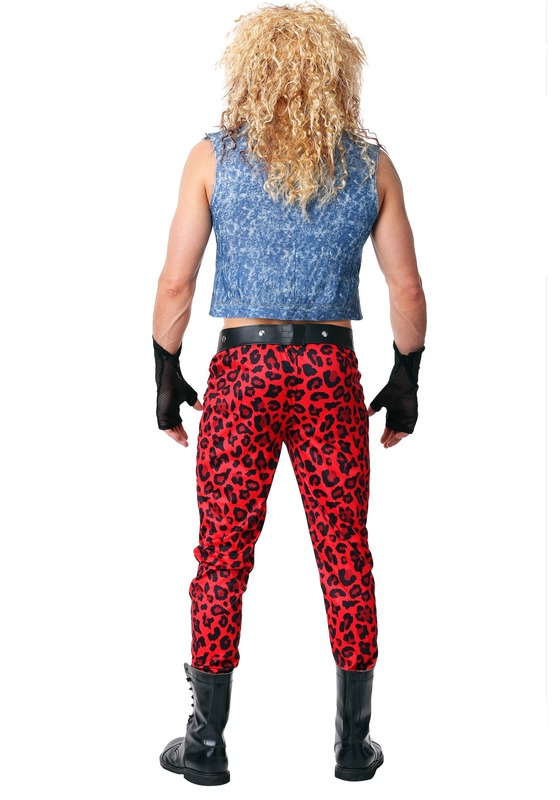 This 80’s Rocker costume brings you the style that's the very definition of rock and roll. The costume comes with a blue vest that has various patches attached to it, including a smiley face and a red and black star. It has metal snaps in the front for fitting, but everyone knows that you wear a vest like this open! That way your manly muscles can hang free on stage! The red pants have a leopard print design and have various patches on them as well. Finally, the black faux leather belt puts the finishing touch to the look that will have you ready to hit the stage! Of course, you can always create a look worthy of an encore if you add a few simple things to this look! Make sure to tease your hair, or grab one of our rocker wigs to get the 1980’s look. Also, carrying around a guitar never hurts with this look!